My diet consists of way too much sugar, baked goods, and ice cream, so I have to make sure to really get in some healthful ingredients by dinner time. A chopped salad always feels fresh and can be changed up so easily by what you have on hand. I had never made my own ranch dressing before and was shocked how easy it was, plus I used light mayo to cut the calories. Any of the ingredients in this can be subbed for what you love. 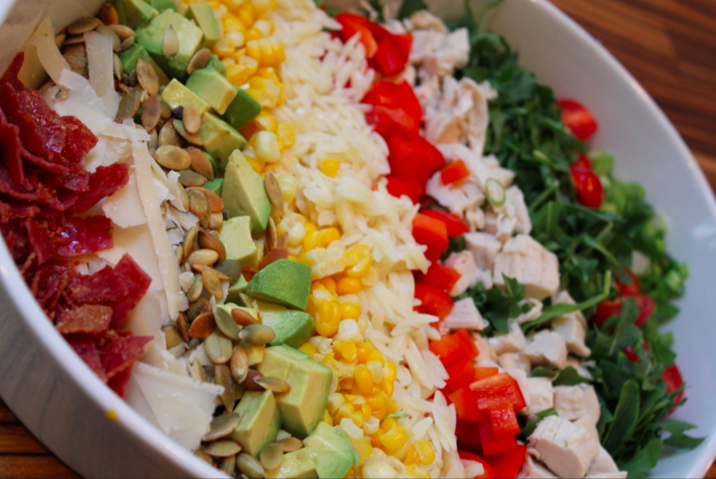 Piling the components up in lines makes for a great presentation and makes it feel a lot less like your run of the mill salad. On a large platter or wide shallow bowl, align the ingredients in lines against one another. Chill until ready to serve. Whisk all of the ingredients together and taste to adjust seasoning. Chill. Serve salad cold and toss with the dressing.